The purpose of this article is to serve as a general strategy guide with tips and advice that you should follow when attempting to win a basic food challenge. There are over 28 different types of food eating challenges around the world, and each type has its own specific strategy that you should follow based on the foods that you are eating. With that being said, there are definitely basic ideas and points that are similar among all food challenges which you should know and understand before focusing on any of the more specific challenge strategies. The most common restaurant challenge around the world is most definitely a large burger served with french fries, and we will be using this type of food challenge to explain all of the basic strategy points. Before you continue reading though, please be sure to watch our extremely informative How To Win A Basic Food Challenge video so that you can see all of our different points put into practice during an actual challenge. For this video, I attempted The Hot Mess Burger Challenge at The Dubliner which is located in St. Louis, Missouri. It is the perfect basic challenge because it involves multiple burger patties topped with cheese and bacon, served between two halves of a Reuben sandwich. The challenge included a side of french fries and 2 additional fried pickles. On top of all that, there were drinks that I was required to finish too. Be sure to watch the entire challenge video so that you do not miss any crucial points. Even just one simple strategy detail can be the difference between winning and losing your next challenge. 1. Prepare by increasing your stomach capacity – Having the required stomach capacity limit to fit the entire meal inside of you is the single most important factor that determines whether or not you have the ability to win a specific food challenge. If you cannot physically fit everything inside your body, the strategy you have and all of the other steps you take will not be able to help you enough, and you will fail the challenge. 5 pounds of food will not fit into a stomach that can only hold 4 pounds. Be sure that you train to increase your stomach capacity level safely and properly by following all of the articles in our Stomach Capacity Training section. 2. Break down and analyze the challenge components – When developing the strategy that you will use to attack and dominate your challenge meal, you must start by breaking down the meal and analyzing each particular component of the challenge separately. 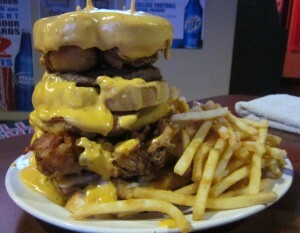 You will most likely fail a large burger challenge if you just try to pick it up and eat the entire thing at one time. Consider what parts of the challenge you know you will enjoy the most, and also decide whether there are any specific components that you know you won’t like. You will want to eat the foods that you dislike most in the beginning. You want to do this because you surely won’t want to eat a food you don’t like towards the end of a challenge. Eat it first while you are fresh and able to quickly force it down so that you can move on. Saving a food you dislike for last is not a smart strategy. I learned that the hard way!! 3. Eat meats and proteins first, and then carbohydrates – In most cases, you want to finish all of the meats, cheeses, vegetables, and toppings before moving on to the carbohydrates. Eat the meats and cheeses while they are warm, juicy, and delicious. The meats and toppings typically make up a very large percentage of the total challenge weight, so get everything down first while you are fresh. You will find that it is usually easier to eat the breads (buns), french fries, and other potato side dishes at the end, especially if you drink an acidic and carbonated beverage while eating them. The occasional exception to this rule is french fries that get really tough to chew and eat when they get cold. Overcooked crinkle-cut french fries are the main culprit from my past experiences. If you encounter a certain carb component that you know is really going to taste terrible once it gets cold and unappealing, you need to finish that item early while you are fresh and the item is still edible. 4. Be confident before beginning the challenge – Whether you think you are going to win, or you think you will not, you are right. If you properly trained to increase your stomach capacity and have put together a well-designed strategic plan of attack, you should be confident that you will defeat the challenge. Do not begin the challenge hoping that you will win, or thinking that you might win. Make sure that you go to the bathroom beforehand so that you don’t feel the need to go during the challenge (because you typically can’t). Put together a pre-challenge ritual or do whatever else you have to do so that you can psych yourself up and get excited about beating the challenge. Before you begin, know that you are going to dominate the meal just like you practiced. To be successful at winning food challenges, you must be strong mentally. Confidence is king!! 5. Keep track of the challenge time yourself – During almost all restaurant challenges that have a maximum time limit associated with it, someone from the restaurant staff will be put in charge of watching you and keeping track of the official time. You will find that some restaurants are much more strict about the time limit than others. Even if there is no specific time limit, you should still keep track of the time yourself with your own timer. You always want to be able to know how much time you have left and how long you have been eating. You most definitely want to keep track of time if the restaurant uses a non-digital timer or stopwatch, because those have a much higher chance of being inaccurate. Stay in control and keep track of time yourself so that you know whether you need to speed up or are able to relax a little. For a food challenger, there are very few things more depressing and discouraging than losing a challenge due to running out of time with just one or two bites left. 6. Listen to music to help you stay focused – If you watch eating competitions and food challenges online, you will most likely see a few people with headphones listening to music while they are eating. By listening to your favorite music, this will help you to stay focused and “in the zone” so that you can dominate your challenge. You won’t be distracted by the noises and people around you, and the music will help you focus less on the fact that you have a massive pile of food in front of you, which will help you eat more. Music can be a very powerful motivator too, so use it to your advantage during eating challenges, just like you do when you are exercising. 7. Drink the required beverages first – There is only so much room in your stomach, and you don’t want to waste too much precious space by filling it with liquids that are not required to win the challenge. Many people fail challenges because they drink too much liquid while they are eating, and run out of room towards the end. If a challenge includes specific drinks that must be finished in order to win the challenge, make sure to drink those first. Finish those before consuming any optional beverages. Even required beverages should be conserved until the end though because that makes sure you are not drinking too much unnecessary liquid. If the challenge has creamy toppings or side items (e.g. coleslaw), use those to help get the chewy foods down rather than liquids. 8. Start off eating as quickly as you possibly can – As mentioned in How Stomach Capacity Training Works, eating speed during a food competition has a geometric pattern, meaning that you will start off very fast in the beginning and your speed eventually begins to decrease as time goes on and you begin to fill up. Depending on your body and total stomach capacity, you only have so long until your stomach and brain starts telling your body that it is full which causes you to begin slowing down. Because of this, you need to eat as much as you can in the beginning while you are fresh and feeling great so that you allow yourself some extra time towards the end (near “the wall”) when you are eating at a much slower pace. Start fast and guarantee yourself victory!! 9. Take many smaller bites rather than a few larger bites – When speed eating, you need to focus on swallowing the food rather than chewing it. Chewing food just takes precious time that you could spend on taking the next few bites. It is much more efficient to take many small bites rather than stuffing your mouth with a few very large bites. If you take very small bites, you can swallow the food a lot quicker. If you take massive bites, you will have to take time to chew the pieces down into small enough bites to swallow, which you could have done much faster just by taking small bites in the first place. Taking small bites reduces jaw fatigue and also makes it easier for your tongue to correctly position the food in your full mouth so that it can be swallowed quickly. 10. Be sure to order your meat and fries correctly – Make sure to specify when ordering your challenge meal that they do not overcook the meat or french fries, especially beef steaks and burgers. Chicken, pork, and other meats have different cooking requirements than beef. I always order my steaks and burgers medium rare so that they are juicy and moist. If the meat gets overcooked, it will by dry, tough, and hard to both chew and swallow. You will need to drink extra liquid to get dry meats down which takes up additional room in your stomach. The same theory applies to cooking french fries and other fried potato side dishes. If the fries are overcooked, they will be crunchy, dry, and tough to chew, especially towards the end of a long challenge when they are cold and upappealing. Be sure the chef knows not to overcook anything. Your jaw will surely thank you after the meal. 11. Have manners but do not eat fries one at a time – Many food challenges are won and lost because of how the eater deals with the french fries. If you take a long time to eat them due to poor technique, you may run out of time and fail the challenge. If you do have a proper strategy and eat them efficiently, you have a much higher chance of success. The easiest way to fail a challenge is to eat your fries and food one bite at a time. While nobody wants to see you eating like a sloppy pig, people don’t want to see you fail the challenge either. Use the techniques mentioned in the video so that you can fill your mouth and get the food down as quickly as possible. If you play around with your food and take too long, you will fail the challenge. You can eat cleanly while still eating quickly, using those techniques. They apply to tater tots and onion rings too, along with other foods. 12. Use your beverages to change up the flavor – Beverages will play a key role in helping you to win your challenge, so choose them wisely. You can choose drinks based on your preference, but I always start with 3 different drinks in front of me. I have one glass of cold water, one non-carbonated flavored drink, and one carbonated beverage. I start with water in the beginning while I am fresh and enjoying the deliciously flavored food. When the flavor begins to dull due to flavor fatigue, I switch to a non-carbonated juice drink such as lemonade because it helps change up the flavor of the food and enlivens my taste buds. Once all of the meats, veggies, and toppings are gone, I switch to a diet soda because the acidity helps break down the bun and fries (carbs) while I am eating them, and the carbonation helps me burp up the remaining air in my stomach so that I free up more room for the food that I have left to finish in front of me. I also prefer the flavor obviously. When you start to get bored of the taste, use liquids to make everything taste better. Just be careful not to drink so much that you don’t have room in your stomach for the remaining food. Take sips of liquid and not big gulps. 13. Finish strong and leave no doubt – We mentioned up above that you should start fast so that you give yourself more time towards the end to finish the challenge, but make sure not to be careless and think you can eat casually because you have a lot of time left. Get the challenge finished and then celebrate by eating dessert if you want to enjoy something casually. Weird things can happen when you are eating extremely large meals. You may think everything is great and that you are feeling strong at one point, and then a minute later your stomach might start feeling upset. If you start playing around towards the very end of your food challenge, something might happen that causes you to fail. Finish strong and leave no doubt. Eat every last bit and crumb of your meal so that the restaurant does not try to say you had a few pieces left on the platter when your time expired, causing you to fail. Leaving no doubt also means that you don’t want to be finishing the challenge with just a few seconds left. Finish well in advance and make sure that the restaurant confirms your new victory. 14. Build your confidence and don’t set yourself up to fail – One of the most common mistakes that amateur eaters make is attempting challenges that they have no chance of winning. If you have never tried a food challenge before, it is not smart to attempt a challenge over 5 pounds (2.28 kg). There are so many people trying food challenges who don’t even get halfway before quitting. These people should never have attempted the challenges in the first place. This goes back to tip #1 above about how your stomach must be able to fit the entire meal inside it. If you don’t have the required stomach capacity to win, you will fail, and there are no questions about it. If you have never done a food challenge before, you need to start small by attempting a one or two star challenge. Build your confidence by gradually increasing the difficulty of your challenges. Please do not set yourself up to fail because you will only find disappointment. Start small and build gradually, just like when exercising, and you will have much more fun in the world of food challenges and competitive eating. These are all basic strategy tips that you can use when attempting any particular type of food challenge. If you understand all of these, you are now ready to move on and learn more specific strategy tips based on each particular challenge type. To go back and view other Strategies Per Challenge Type articles, click here.